Photo by La Asociación de los Amigos y Vecinos de Casco Viejo. 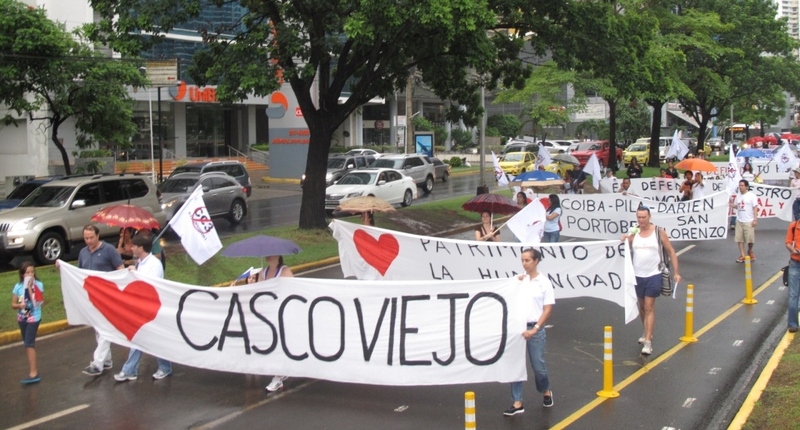 On June 26, over 500 protesters, undeterred by torrential downpours, hit the streets of the Old Town and demanded that President Martinelli and his administration abandon their plans to construct what is known as “Cinta Costera III,” a multi-billion dollar project that consists of a series of bridges, landfills and pedestrian pathways that the government says is necessary for the vitality of the city as well as for the residents of Chorillo, a bordering ghetto. It is a matter of priorities, those of big business and those of the people here. The former administration placed a higher priority on social investment and was establishing the infrastructure and mechanisms that would help the area’s most vulnerable inhabitants — things like low-income housing and schools. But the Martinelli administration has converted most of these previous developments into opportunities to expand its political power and influence for the benefit of the rich. There is no need for this project and it is a huge waste of tax dollars. It will only benefit a small group of greedy people. The whole country is in crisis and is selling its assets. The last thing we need is something like this. They are going to kick out every single person from Chorrillo, everyone knows it. Right now, they are going into Chorrillo and offering people there $20 to come out and speak out in support of Cinta Costera. And this is what we are up against. To be clear, I believe this project is not necessary, at least for the reasons that the Government proposes. The government likes to reiterate that the project will lead to the creation of jobs, but this is not the way to achieve such an end. With a more comprehensive and planned approach, so much more could be achieved. In addition, the way the project has been planned, we now run the risk of losing our World Heritage status, all the while breaking national laws and setting a bad precedent. The worst part is that it would affect the integrity of the community given that the project would distort the very narrative that this site offers. Little in the way of evidence from urban development specialists (engineers, city planners, etc.) has been presented by the state, a fact that only fuels public suspicions of the government’s greed. In fact, the lack of transparency regarding the relationship between the state and Norberto Odebrech, the Brazilian contractor responsible for Cinta’s construction, has created an altogether corrupt atmosphere surrounding the project. In addition, an alternative, less costly and seemingly more sensible plan which called for the construction of a tunnel has been mysteriously scrapped. Panama Viejo, the site of the country’s original capital and also a designated UNESCO World Heritage site, is facing a similar fate. Residents there may be expelled while excavations and projected plans — also “won” by Odebrech — threaten the integrity of monumental sites of historical significance.